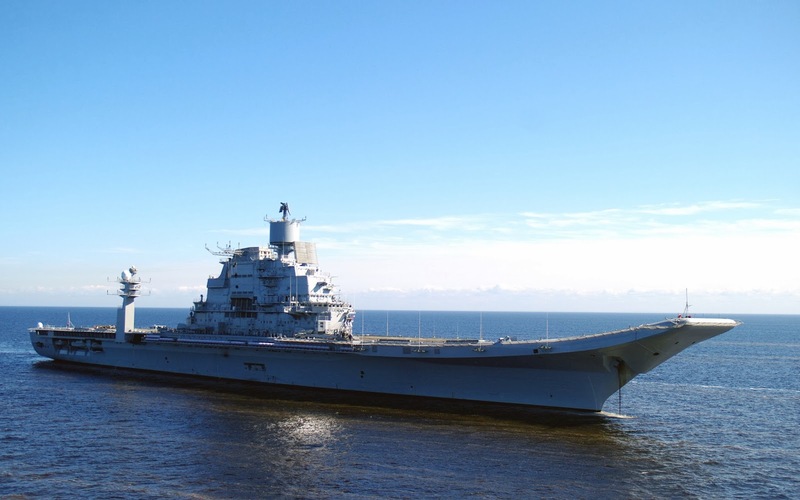 Defence Minister Shri AK Antony will be commissioning Indian Navy’s aircraft carrier ‘Vikramaditya’ at Severodvinsk in the Russian Federation in the presence of a galaxy of dignitaries such as Deputy Prime Minister (Military Issues) of the Russian Federation Mr Dimitry Rogozin, Chief of Naval Staff Admiral DK Joshi and Ambassador of India to Russian Federation, Mr Ajay Malhotra. A backgrounder on the momentous Vikramaditya project is presented here along with select photos. At the time of attaining our Independence our visionary leaders saw the centrality of a powerful Navy and set us on the right course by envisaging an Indian Navy centred on aircraft carriers for sea control in our expansive areas of maritime interest. INS Vikrant, India’s first aircraft carrier was acquired from Great Britain and commissioned on 04 Mar 1961. INS Vikrant was a Majestic class CATOBAR (Catapult Assisted Take Off but Arrested Recovery) carrier and operated Sea Hawk fighters, Alize (Anti-Submarine Warfare) aircraft and Seaking helicopters. Consistent with its vision, India next acquired HMS Hermes, a Centaur class STOVL carrier and a veteran of the Falkland War. INS Viraat was commissioned on 12 May 1987 as India’s second aircraft carrier and India’s first STOVL carrier operating the Sea Harrier aircraft. Soon after the acquisition of INS Viraat, INS Vikrant was also converted from a CATOBAR carrier to a STOVL (Short Take-off and Vertical Landing) carrier. INS Vikrant was decommissioned on 31 Jan 1997, after 36 years of glorious service under the Indian ensign. For almost a decade India had two aircraft carriers and the Indian Navy was fully cognisant of the criticality of having an aircraft carrier available for deployment on each seaboard to fulfil the Navy’s assigned tasks. In recognition of the importance of aircraft carriers, the Indian Navy had already started exploring the possibility of indigenously designing and constructing an Aircraft Carrier, this project took off in right earnest in the late 90s as the Air Defence Ship was conceived. However, given the long gestation period of such projects, the search for a replacement for INS Vikrant gained momentum as its decommissioning drew closer. It was at this juncture that Russia offered Admiral Gorshkov to the Indian Navy. Negotiations over acquiring the 44,500 ton Admiral Gorshkov started in 1994. 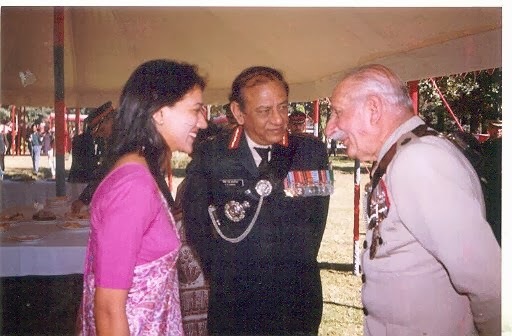 Various high level delegations who had assessed the ship had independently concluded that the ship’s hull was in good material state and would be worth considering for exploitation in the Indian Navy with a suitable mix of aircraft. After detailed negotiations the two countries signed a memorandum of understanding in Dec 1998 during a visit by Russian PM Yevgeny Primakov. The Inter-Governmental Agreement which included acquisition of Project 11430 (Admiral Gorshkov) was signed between the Federation of Russia and the Union Government of India on 04 Oct 2000. After a Detailed Project Development Review, contractual negotiations and thereafter price negotiations, Government approved the acquisition on 17 Jan 04 at a cost of Rs 4881.67 Cr for the complete package of R&R of the ship, spares, infrastructure augmentation and documentation. The deal was signed on 20 Jan 04 and the effective date of the contract was established as 24 Feb 04. The R&R of the ship commenced from 09 Apr 04. The repair and refit was being undertaken by FSUE Sevmash, the state owned shipyard at Severodvinsk, Russia. The R&R was scheduled to have been completed within 52 months. Though the refurbishment process was started in right earnest, soon it was realized that the work and equipment requiring replacement was significantly higher than originally estimated. Entire length of cable, large portions of steel hull, motors, turbines and boilers, etc. would have to be completely replaced with resulting in cost escalation and time slippage. A protracted renegotiation for arriving at a mutually acceptable price for refurbishment was held in the ensuing months. Finally, in Dec 2009, the Indian and the Russian sides arrived at an agreement on the final price of delivery of this ship. More significantly, it was agreed that the delivery of the ship would take place only in the year 2012. Though the re-negotiated price was significantly higher than what was originally agreed upon, the fillip that the addition of Gorshkov would give to the Blue water requirements of Indian Navy compensated the greater price. The journey of ‘Vikramaditya’ began as the Kiev class aircraft carrying cruiser ‘Baku’. Developed from the Moskva class helicopter carrying guided missile cruisers the Kiev class was a pioneering Soviet era design, featuring a flight deck arrangement capable of operating fixed wing VTOL fighters for the first time in the Soviet Navy. Baku was constructed by Chernomorsky Ship Building Enterprise, Nikolayev (now in Ukraine). About 400 enterprises and nearly 1,500 - 2,000 workers from different republics of USSR took part in building of the ship. The ship was commissioned on 20 Dec 1987. Conceived as an armed cruiser, Baku was heavily armed with twelve Anti-Ship Missile launchers, ten gun mounts of differing calibre and rocket launchers and depth charges. The air element comprised Yak-38 aircraft. ‘Baku’ was envisioned to be a full-fledged aircraft carrier by Admiral SG Gorshkov, however, due to conflicting dynamics at that time, the ship turned out as the last ‘compromise’ ship of the Kiev series. 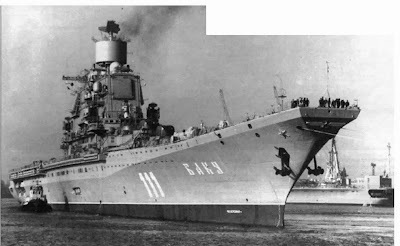 After her development and construction, it became clear to the Soviet leadership that the vision of Admiral Gorshkov of a classical aircraft carrier with ship borne aircraft as the primary weapons was indeed the most logical way ahead to develop the surface forces. On 07 Nov 1990, the ship was named after Admiral Sergey Georgiyevich Gorshkov. Baku/Admiral Gorshkov began its active operational service with the Northern Fleet and was deployed in the Mediterranean Sea and remained in active service till 1992 and thereafter continued in service albeit with limited operational deployments. The ship was finally decommissioned in 1996. 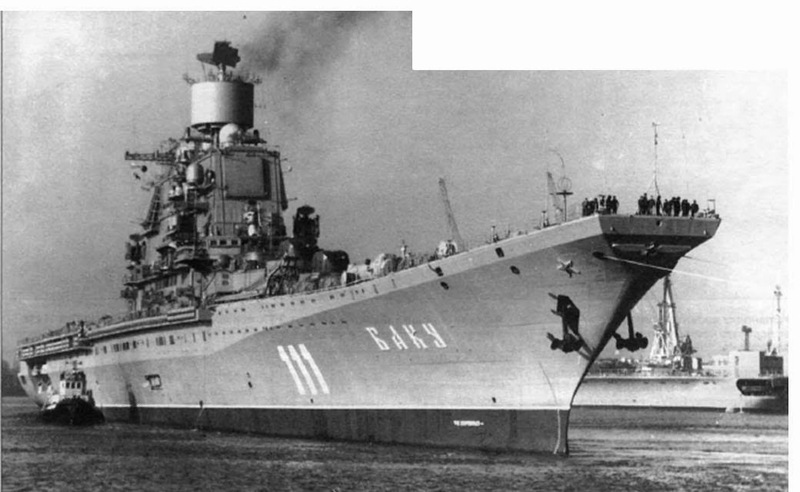 Admiral Gorshkov was put in hibernation after her last sailing in 1995. 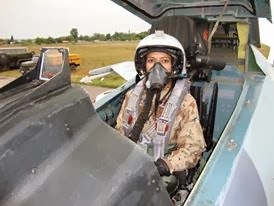 With most of her equipment lying un-utilised since then, the task of breathing life and converting her from a VTOL (Vertical Takeoff and Landing) missile cruiser carrier to a STOBAR aircraft carrier involved substantial degutting, equipment removal, refit and re-equipping. The major works envisagedwere modification of flight deck to include ski-jump and arrester gear; modification of bulbous bow, aft aircraft lift & ammunition lifts; modification of 1750 out of 2500 compartments; installation of new main boilers; installation of new and additional Diesel Generators; replacement of existing distilling plants; fitment of Reverse Osmosis plants, new AC plants and Refrigeration plants and installation of new sensors and equipment. 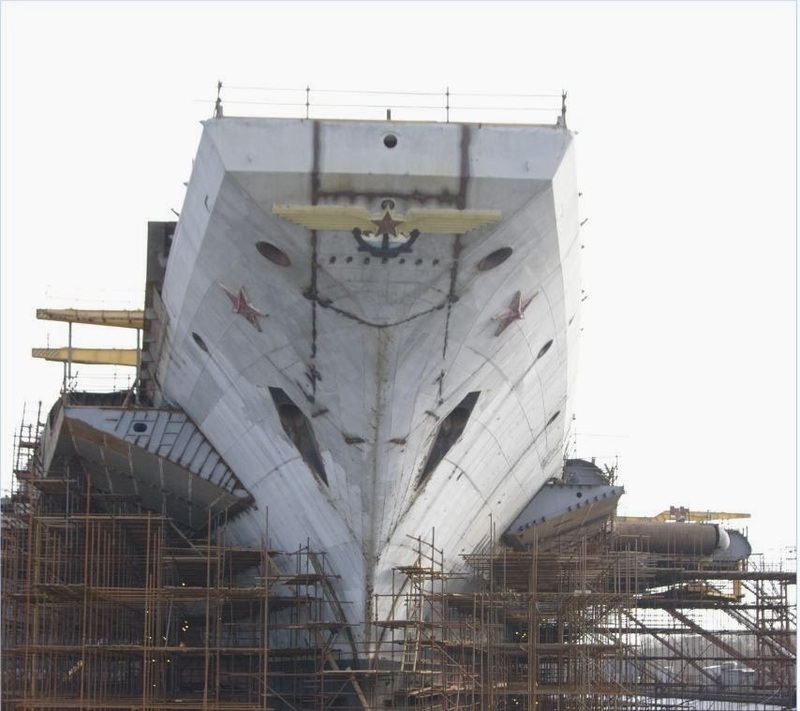 In 2007, as the refit and repair of the ship was in progress, the yard realized that the scope of work was much larger than initially estimated and so a revised timeline for completion of the task of modernization was agreed upon by both Russian and Indian sides. With a revised timeline the delivery of ship was expected by end 2012. Creation of the flight deck with structural modification to convert the VTOL carrier to a STOBAR carrier was the most intricate and arduous. The task involved installation of Sponsons to increase the breadth at the Flight Deck and a fitment of a new 14 degree Ski jump, strengthening of arresting gear area, strengthening of run way area and elongation of the aft end to generate the required length of landing strip aft of the arresting gear. In all 234 new hull sections were installed to achieve the desired shape. Total steel work for carrying out structural modification on flight deck amounted to 2500T. The superstructure was modified to accommodate a host of sensors and equipment such as radars, Electronic Warfare suite and Action Information Organisation system and other systems to suit the requirements of ship borne fighters and rotors. A very unique structural modification that was carried out on board the ship was the installation of the aft mast for accommodating various communication antennae. 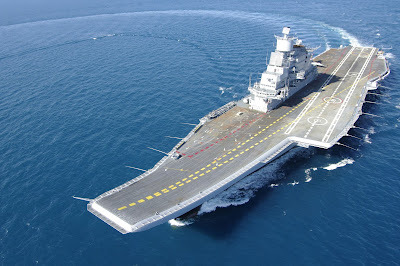 Vikramaditya in its older avatar was powered by boilers fuelled by heavy oil, FFO. The re-equipping included replacement of these old boilers with state of the art boilers utilizing LSHSD and providing a steam capacity of 100 Tonnes per Hour each. The initial estimate included replacement of only 1400 kms of old cable with new cables. However, as degutting progressed and confined spaces were accessed it was realised that an additional 900 kms of cable will need to be replaced. Finally the mammoth task involved replacing 2300 kms of cable, which is a little short of half of the entire coastline of India. The modification plan of Vikramaditya was not restricted to the gears and sparks alone. The change also necessitated revamp of the living spaces and galleys to cater to the needs of the Indian men in uniform. Of 2500 a total of 1750 compartments were completely re-fabricated. A host of new galley equipment suited for preparation of Indian food like dosas and chapatis was also installed. The conversion of VTOL carrier to STOBAR involved fitment of three 30m wide arrester gears and three restraining gears. 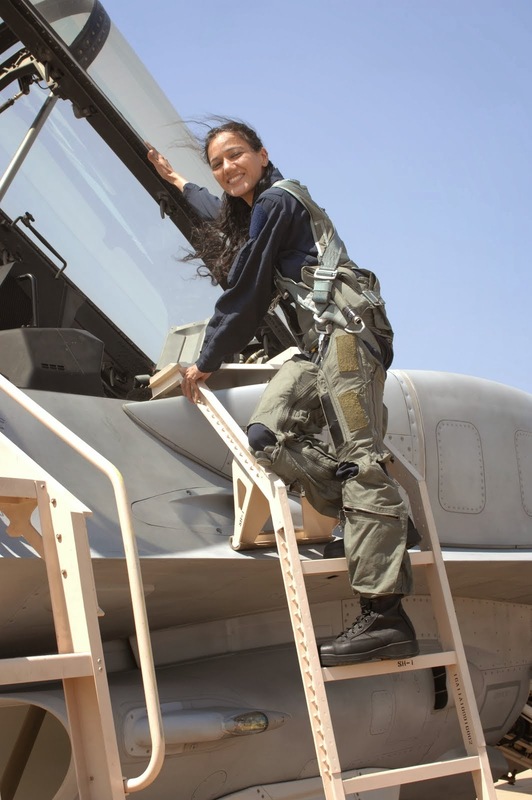 Installation of these equipment not only involved modification and strengthening of the flight deck but also changes to internal layout of compartments. To sum it up, a total of 234 new hull sections were fabricated using 2500 tonnes of steel which is almost equivalent to the standard displacement of a mid-size frigate. Repair and re-equipping of Vikramaditya to give a new lease of life as a full- fledged carrier was no mean task and was probably as demanding a task as constructing a similar tonnage ship from the drawing board. The task was enabled by the expertise and experience of the Russian designers and yard workers working hand in glove with Indian experts. The extreme cold weather conditions of winter only made the work environment harder. 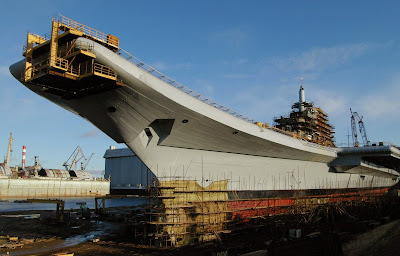 At the end of this refit, spanning a little short of a decade, Vikramaditya has metamorphosed into a fully capable and potent platform. Vikramaditya sailed for the first time under own power at 1200 hrs on 10 Jun 12, after a gap of about 17 years. An aircraft carrier carrying potent long range multi-role fighters is a platform inherently deigned for power projection. In as much as ‘Gorshkov’ was transformed to create ‘Vikramaditya’, so also Vikramaditya will transform the face of the Fleet Air Arm of the Indian Navy. Vikramaditya, the floating airfield has an overall length of about 284 meters and a maximum beam of about 60 meters, stretching as much as three football fields put together. Standing about 20 storeys tall from keel to the highest point, the sheer sight of this 44,500 tonnes mega structure of steel is awe inspiring. The ship has a total of 22 decks. With over 1,600 personnel on board, Vikramaditya is literally a ‘Floating City’. Associated with this large population is a mammoth logistics requirement - nearly a lakh of eggs, 20,000 litres of milk and 16 tonnes of rice per month. With her complete stock of provisions, she is capable of sustaining herself at sea for a period of about 45 days. With a capacity of over 8,000 tonnes of LSHSD, she is capable of operations up to a range of over 7,000 nautical miles or 13000 kms. To enable this 44,500 tonnes floating steel city to cut through the choppy seas with speeds of up to 30 knots, she is powered by 08 new generation boilers of steam capacity of 100 TPH at a very high pressure of 64 bars, generating a total output power of 180,000 SHP. Vikramaditya heralds in a new generation of boiler technology with a very high level of automation. These high pressure and highly efficient boilers power four enormous propellers, each greater in diameter than twice the height of an average male. Such a four propeller - four shaft configuration is another first in the Indian Navy. The 06 turbo alternators and 06 diesel alternators onboard generate a total electricity of 18 megawatts to power various equipment of the ship, enough to cater to the lighting requirement of a mini city. The ship also houses 02 Reverse Osmosis plants providing an uninterrupted supply of 400 Tons per day of fresh water. An extensive revamp of sensors including fitment of Long range Air Surveillance Radars, Advanced Electronic Warfare Suite makes the ship capable of maintaining a surveillance bubble of over 500 kms around the ship. 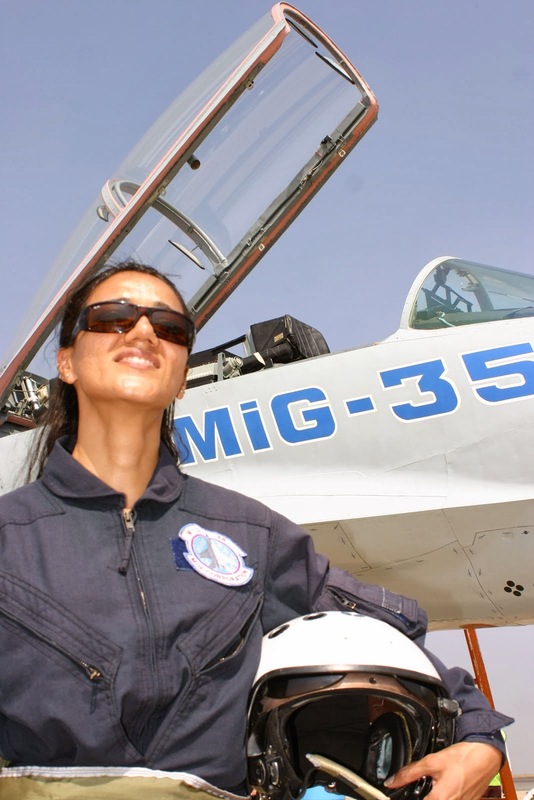 The ship has the ability to carry over 30 aircraft comprising an assortment of MiG 29K/Sea Harrier, Kamov 31, Kamov 28, Sea King, ALH-Dhruv and Chetak helicopters. The MiG 29K swing role fighter is the main offensive platform and provides a quantum jump for the Indian Navy’s maritime strike capability. These fourth generation air superiority fighters provide a significant fillip for the Indian Navy with a range of over 700 nm (extendable to over 1,900 nm with inflight refueling) and an array of weapons including anti-ship missiles, Beyond Visual Range air-to-air missiles, guided bombs and rockets. The heart of the operational network that infuses life into the combat systems onboard the ship is the Computer aided Action Information Organisation (CAIO) system, LESORUB-E. LESORUB has the capability to gather data from ship’s sensors and data links and to process, collate and assemble comprehensive tactical pictures. This state of the art system has been specifically designed keeping in mind the essential requirement on the carrier for fighter control and direction. One of the most prominent equipment fitted on the super structure is the Resistor-E radar complex. Resistor-E is the automated system designed for providing air traffic control, approach/landing and short range navigation for ship borne aircraft. This complex along with its various sub-systems provides navigation and flight data to ship borne aircraft operating at extended ranges from the mother ship. 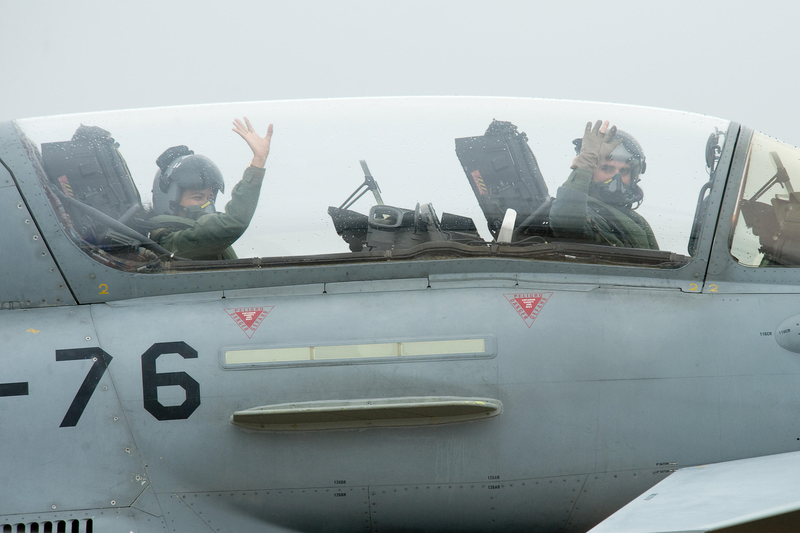 The precision approach guidance system aids the fighters on approach to be directed down to a distance of 30 meters short of flight deck. Vikramaditya also boasts of a very modern communication complex, CCS MK II, to meet her external communication requirement. Installation of Link II tactical data system allows her to be fully integrated with the Indian Navy’s network centric operations.